Hsiung Feng III Anti-Ship Missile Display in Chengkungling. The Hsiung Feng III (HF-3; Chinese: 雄風三型, "Brave Wind III") is an advanced long range supersonic missile designed to carry either a conventional warhead or a nuclear weapons warhead, biological weapons warhead or chemical weapons warhead and to strike military and civilian targets such as nuclear reactors deep inside the mainland of the People's Republic of China (PRC). It is the third generation of Taiwanese technology in the Hsiung Feng series of long range missiles, with capabilities to destroy both land based targets and naval targets, all having been developed by the National Chung-Shan Institute of Science and Technology (CSIST) in Taiwan. A fourth generation improved, advanced version of this missile is currently in development having improved survivability, better avionics, increased speed, a bigger warhead payload and the ability to hit targets at longer ranges, of over 1,500 Km away. CSIST started a ramjet test vehicle program in 1994, and this project was later merged with the Hsiung Feng program. Flight testing of a prototype started in 2001. Operational testing and evaluation was started in 2004 and was completed by 2005, on board the PFG-1101. The missile uses the design of an integrated rocket ramjet, which not only minimizes its size and weight but also increases its operational flexibility. It uses a solid fuel main booster with two side-by-side solid-propellant jettisonable strap-on rocket boosters for initial acceleration and a liquid-fueled ramjet for sustained cruise. It also employs electronic counter-countermeasures (ECCM) capabilities allowing it to penetrate an enemy ship's defenses. The missile is cylindrical in shape and composed of three sections, namely guidance and control, warhead, and propulsion. The body has four inlet ducts and four clipped delta control surfaces. It used the inertial navigation system (INS) during mid-course navigation phase and active radar seeker at terminal guidance phase. The air intake design arrangement was reported to have been optimized for evasive maneuvering at terminal sea-skimming altitudes. The missile is designed to be capable of way-pointing and can be programmed to fly offset attack axes to saturate defenses. It is also capable of high-G lateral terminal "random weaving" maneuvers to evade close-in defenses. The missile travels at supersonic speeds (Mach 2.5-Mach 3.0) at sea-skimming altitude with a special trajectory at the terminal phase, reducing the reaction time of the target ship. It also features an armor-piercing warhead which generates tremendous destruction after hitting the target. The warhead is equipped with self-forging fragments and in the 225 kg (496 lb) weight class. The warhead triggered by a smart fuze that directs most of the energy downwards, inside the target ship's hull. The missile is believed to have an operating range of 150–200 km (93–124 mi; 81–108 nmi) with a possible maximum range of 300 km and a minimum range of 30 km. It can be deployed on ships and mobile trailers. The instructions for missile launch can be issued by a command and control system for different platforms and different paths leading to saturation of a ship's defense system. In February 2017, Taiwan revealed that it had increased the HF-III's range to 400 km (250 mi; 220 nmi). 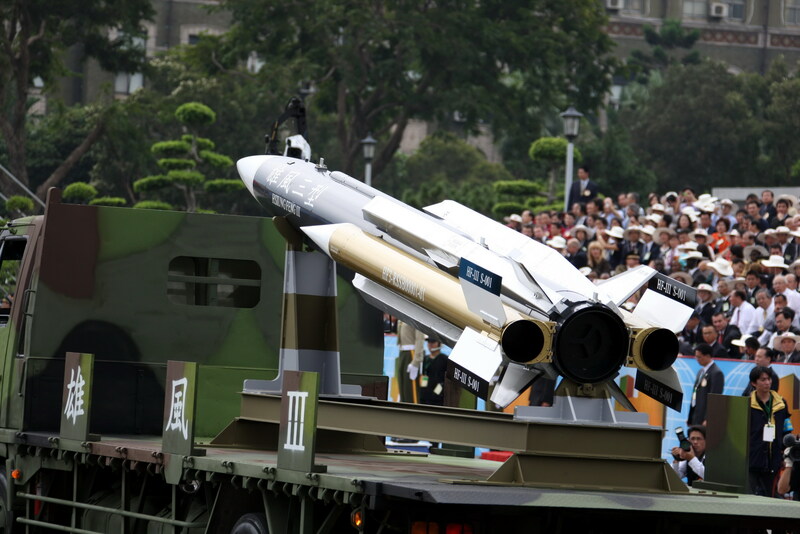 The missile was officially revealed on Oct. 10, 2007 at a military parade in Taipei, Taiwan. It has now been deployed aboard the ROC Navy's Lafayette/Kang Ding class frigate, Cheng Kung class frigate and Jin Chiang class patrol gunboat. On July 1 2016, Chinchiang (PGG-610) of the Republic of China (Taiwan) Navy accidentally fired a Hsiung Feng III missile during a training exercise. The missile traveled a distance of about 75km before it hit a fishing boat The captain of the boat was killed and three crew members were injured. The Taiwan Ministry of National Defense stated that the warship’s commander, senior arms officer and missile launch control sergeant had all failed to follow standard operating procedure. ^ a b c d e f g h Mei, Fu S. "Supersonic ASCM Equips Frigate," Taiwan Defense Review, August 10, 2006. ^ "Taiwan mistakenly fires supersonic missile killing one - BBC News". Bbc.com. Retrieved 2017-02-02. ^ a b c d e f g "NCSIST". www.ncsist.org.tw. Retrieved 2017-02-05. ^ Hsiao, Russell. 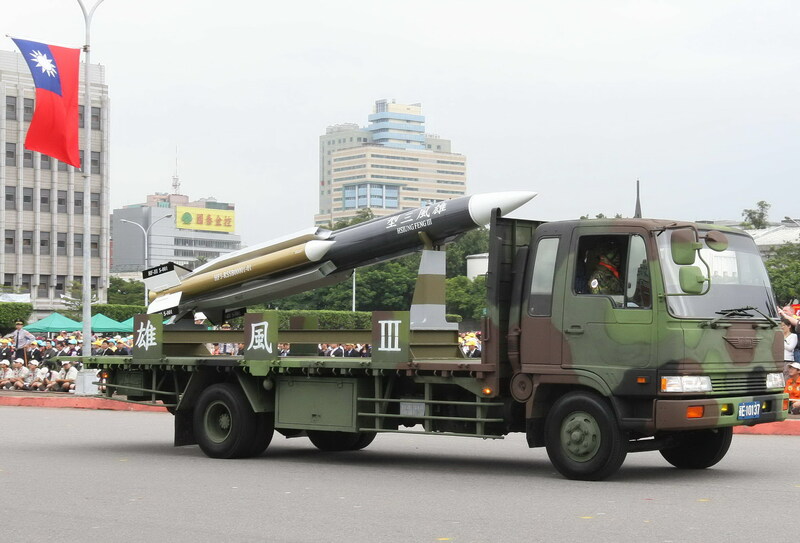 "Taiwan Reportedly Plans to Upgrade Supersonic Hsiung Feng III Missiles". The National Interest. Retrieved 2017-02-05. ^ a b "More HF-3 missile deployment mulled - Taipei Times". www.taipeitimes.com. Retrieved 2017-02-05. ^ "Taiwan's Hsiung Feng III missile vs. China's CX-1 | Cross-Strait Affairs | FOCUS TAIWAN - CNA ENGLISH NEWS". Retrieved 2017-02-05. ^ Post Magazine. "Taiwan launches investigation into deadly navy anti-ship missile misfire | South China Morning Post". Scmp.com. Retrieved 2017-02-02. ^ "Wayback Machine". 28 July 2011. ^ "Taiwan mistakenly fires supersonic missile killing one". BBC News. 2016-07-01. Retrieved 2017-03-16. ^ Ramzy, Austin (2016-07-01). "Taiwan Navy Accidentally Fires Antiship Missile, Killing Fisherman". The New York Times. ISSN 0362-4331. Retrieved 2017-03-16. ^ "Ministry seeks to debunk missile launch conspiracies". Taipei Times. Retrieved 2016-07-04. Wikimedia Commons has media related to National Chung-Shan Institute of Science and Technology.